I discovered PIDA while reading around Fedora mailing lists (forgot which thread), and decided to try it out. yum'ed it from the Fedora repository, and launched it. My first impression - Coool!.. 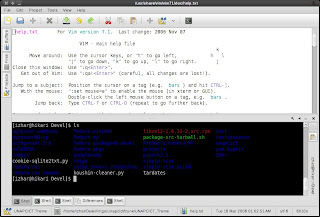 its gvim + version control + shell/terminal + customizable IDE, all in one!. I usually do development with very basic tools - gvim and a bunch of shells/terminals. I don't like most IDE because of the over-complexity of them. 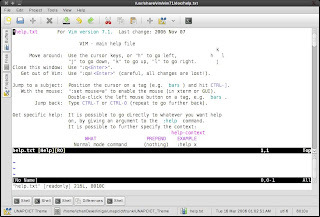 I do use geany or gedit once in a while when I want to have a bit of non-vim'ish behaviour of text editor. But PIDA, its a whole different level. It looks very promising to be my next best-friend. 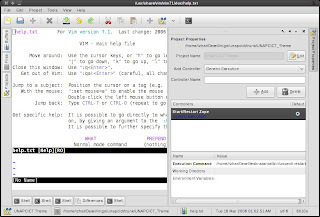 Not so long after, that I started using it for continuing my current project with Inigo, and quickly, it took over my daily use of gnome-terminal, and my frequent need to change directories and restart Zope. The basic version control feature it have is wonderful. 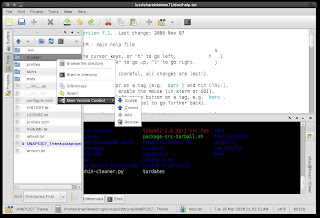 Unlike Eclipse or other IDEs where it is quite hard to get flexibility on how the project is laid out because of the "smartness" of the IDE, PIDA's basic, "stupid", yet useful, version control integration JustWorks. So far, I have fell in love with this IDE. I haven't tried its other features yet, but I'm quite sure its going to be fun. Its written in Python, so it should be easily extendable. Going to use this a bit more longer and see how my comfort with it - its already replaced my habit of using gnome-terminal at this point of time. If you want help on making your extensions, don't forget to drop by #pida on irc.freenode.org; the devs are really chilled out ime, and a great source of knowledge on python and development in general, as well as pida itself.